Posted on September 9, 2015 at 5:25 am. Guts Casino’s live dealer platform is one of the most prestigious live gaming interfaces online, and having been in operation for over two years now, its live dealer roulette title is fast approaching its 125,000th spin. 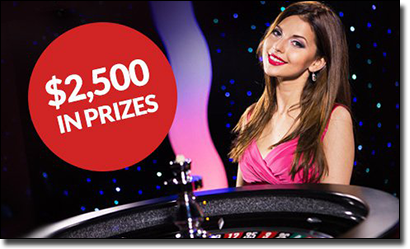 To celebrate this milestone, Guts Casino is running a nifty promotion for all live dealer roulette participants from the 1st of September, 2015, until the 125,000th live roulette spin occurs. Not a registered Guts Casino member yet? Sign up for an account at www.Guts.com via any platform (desktop, mobile, tablet or Smart TV) by clicking this link for exclusive deals, and securely deposit some cash via one of the several AUD-friendly and globally trusted banking methods, and head to the live dealer casino lobby to choose from a selection of great live croupier roulette games, including the 2014 eGaming Review ‘Game of the Year’ winner, ‘Immersive Roulette’. If you manage to place a wager 60 seconds either side (before or after) the 125,000th live spin on any live roulette title, you’ll earn yourself a share of $1,750 in cash. A share in $750 cash is also up for grabs for players who manage to place a bet 60 seconds either side of the 120,000th live spin. For every $100 you wager on any live croupier roulette games, you will receive one ticket for a cash prize draw which will be carried out at the conclusion of the promotional period (there is no limit on the amount of tickets any one player can earn). All cash prizes are free from any wagering requirements – a rare player benefit across most online and mobile casino promotions. Additionally, players who take home cash prizes will also receive a Guts Casino hooded jacket. If you are one of the lucky winners for any prize, you will be notified by email, so ensure your details are up to date and that you check you email account every so often. For the full terms and conditions of this cool promotion, head to Guts Casino’s promo page, where any queries you have should be answered. We highly recommend playing Immersive Roulette, which offers an exclusive gaming experience where the players can enjoy all the live action, from unique camera angles, shot in 200 frames-per-second high definition video, with slow motion replays of the winning number as the ball comes to a stop. Across all live roulette games, you can customise your betting limits, chat with the dealers, place call bets, check gameplay history such as recent numbers and hot and cold numbers, play multiple tables at the sane time, and enjoy other quality features. Live gaming is only available within real money mode.